Stonewall Gazette: NAACP: Is Gay The New Black? NAACP: Is Gay The New Black? "The Rev. 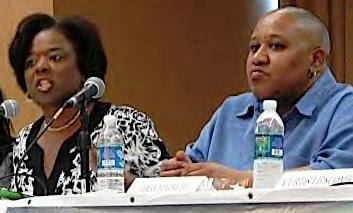 Wendell Anthony of Detroit's Fellowship Chapel proved an unlikely patron for a historic discussion of gay rights in the black community in downtown Detroit's Cobo Hall on April 30, 2010." Part of the ninth annual Freedom Weekend founded by Rev. Wendell Anthony, the lively and at times heated discussion played out over a town hall meeting given this provocative title: "Is Gay the New Black?" An overwhelmingly black audience of approximately 200 people attended the forum. Anthony, the eight-term president of the Detroit NAACP chapter - the largest in the country - didn't answer the event's title question, but he strongly defended the decision to pose it. "One of the things I heard is, 'Rev. Anthony, why would you dare have something like this? Is gay the new black? Are you out of your mind?'" he said at the start of the meeting. "No, I'm in my mind. We believe in thinking," he added. The assembled panel was then invited to take turns at answering the meeting's namesake question. "I would say being black and gay is the old black because the black LGBT community is the invisible 'Don't Ask, Don't Tell' staple of the black community," remarked Sharon Lettman, executive director of the National Black Justice Collation, a Washington, D.C.-based black LGBT advocacy organization. Anthony Samad, a prominent columnist in the African-American press, criticized the question for ignoring black sensitivities - and for being imposed from outside.